I was trying clothes in a boutique awhile ago when a 50+ woman stood in front of a mirror in a red jacket. I looked at her admiringly, and said that I liked it on her. "It's a kind red", she said, and I understood right away. The red drew but did not dominate the eye. Reds are pesky. A great shade will spark an ensemble; the wrong one kills any vestige of elegance; it's as loud as a bully in a bar. This is a recent shot from the colour-rich blog Advanced Style, and let me only say the cigarette is the least of this woman's risks. She's going to damage her eyesight in this garish, almost neon red. Advanced Style seems to have a "Older? The more colour, the better!" aesthetic. While I sometimes admire the people photographed, or at least salute their nerve, this woman is more three alarm fire than red-hot mama. Is Gloria Allred subliminally influenced by her name? Aaaand... I have to show Nancy Reagan, here in Valentino red, her trademark. I found it overpowering on her thin frame. Aggressive, aging, brassy reds. Some women can wear a bright red, but few look good in a big swath of near-neon. Talbot's stretch Cotton Trench from this season is called "Paprika", a red with a hint of brown. Not nearly as aggressive and aging as the nearly-neon reds above. The colour of this Marc by Marc Jacobs knit jacket is called "Poinsettia"; it's a pink red, softer than screaming red-red, but with plenty of presence. If you're a red-lover, be fanatical about fabric quality, and spend more to score a sublime red. You're unlikely to find kind reds in low end, where jarring, dull or nasty hues abound. Barbara Tfank's deep red dress is discreetly stunning; the shade doesn't wear her or fatigue the eye. Rachel Stevens in a tomato red dress; a shade often worn by deep brunettes. Luscious shade, but not always kind to those of us who could be Rachel's mum. When tomato works, it sizzles. Try it and get an honest evaluation from your friends. I have a friend in her 80s who is divine in her tomato bouclé Chanel-style jacket and gray pencil skirt. There are many other flattering reds, from crimson through garnet, the berries, wines and violet-reds. To show a red to advantage, quality is paramount; any red shade can easily look cheap and harsh with inferior dye or fabric. Avoid primary red, except for small accessories. There will be a red that sings for you, but persist and be picky till you know what it is. Red and black is very high contrast, and therefore considered a 'power dressing' strategy; I usually don't gravitate toward it as a rule- too tough. But I would break the rule and the bank to wear this Erdem dress. Red with white carries a youthful, almost naive connotation that makes a 50+ woman look rather unsophisticated. 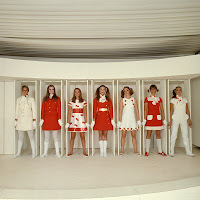 These Courreges dresses are child-like and "adorable", which at one point in life signals desperation or simply being stuck in your cheerleader years. Red, white and blue: patriotically American and not very original. This medium-contrast Babette San Francisco ensemble, red with denim blue, avoids the commonplace and softens a highly saturated red. Red with gray, like this Donna Karan suit, is classy, and much softer than black. The quality of the jacket lends the red a richness that makes the difference. Dries van Noten, master of colour, shows that red (in this case, an assertive tomato cashmere) and camel do not have to look conservative. Ruby red skirt with soft fern green jacket and charcoal sweater, by Bill Blass. Along the same audacious lines, wine with true red, and please note the vivid green skirt, from J. Crew. If you add one more colour, green is interesting with red, and the third colour keeps it from reading "Christmas". The master, Van Noten again, and I'm ending here because it doesn't get more refined than this: slate blue, khaki, and berry charmeuse pants. Red: Get it right and you'll light a room, get it wrong and people would rather see you exit. One of my friends, who is very good with color, divides red into yellow reds (those at the top of your post) and blue reds (more flattering to most). Tomato red used to be one of my best colors, but I haven't worn it (or even seen much of it available) for a long time, and am not sure how it would look on me now. I love the Talbot's "paprika" in concept, but it looked too muddy on me. I can't being myself to wear red and green together (though I did see a bit of this in Paris). LOVE that last Dries van Noten you showed...just gorgeous! Frugal: Yes- and extend thinking to brown-reds pink-reds, or purple-reds. These do have either yellow or blue undertones but are more complex than that lone distinction. Pseu: Tomato just seems to be on hold now, I'm seeing pink partout. Beautiful post Duchesse. You worked hard on this one, I can tell. I agree, soft, muted reds will suit, while harsh, bright or intense reds will overpower. My red is a deep and soft rosy red. But I Have so far only found ONE item that meets my criteria for wearing red; a scarf bought on Rue Rivoli in Paris--about 15 Euros. It is a lovely color. I think old people wear so much color because they don't want to fade into the woodwork, ,literally. It's their way of saying, "Hey! I'm still here! Look! I'm old, but I'm really ALIVE". I think this was the case for my 105 year-old grandma. I wear red (blue-based or brownish, generally) as an accessory often, almost always in fact, but although I can wear it near my face in scarves (and this is a fairly recent discovery -- up 'til a few years ago, I didn't even think that would work, but I found the right shades), I don't feel comfortable with it as a whole top -- I'm keeping an eye out, though, for a fabulous red skirt, perhaps a print -- and I did have a red-and-white sundress I loved a few summers ago. Broke one of your rules there, didn't I! Great post. I love red and green together but usually far apart on my body - i.e., sweater and shoes. Who can forget Mrs. Obama's red and black on election night. She even dressed her girls in it! Great post. The subject is timely for me--I have recently banished red from my wardrobe. Since I began coloring my gray hairs red seems too harsh for me. Now I'm going to rethink the matter. Anonymous: Sorry I can't recall her name- it was from a piece I read in the NY Times (I think the magazine?) within last 16 months or so; she and her husband are both elderly, in the arts, live in NYC. When they were first married, her mother and MIL used to make her "exquisite dresses", and she said now wears that uniform. Susan W H: Was sale-shopping today and there's so much mean red out there. Jacqueline: Anjela is a friend of mine who occasionally comments here. She is wonderful in many respects. She is a writer, mother, and owner of a small shop. I just binned a red lipstick for it looked so harsh on me when I saw a photo taken a week ago! red is such a hard colour as you get older and your post was great at explaining why. I have taken notes! *that browny/red is such a hard colour to find but I love it! Brilliant post Duchesse. When I do colour analysis, the colour I find most telling is red. The right red makes a person look warm, healthy and have an inner glow, the wrong one makes them look like they've been at the sherry bottle a little too often. For many women as they age, they need a softened red, the occassional one can still wear a brighter red, but they need to have intense colouring naturally. As we grey, our skin loses pigments and so we can't keep wearing the brighter shades, instead we need to opt for those that have a softness to them. Imogen: Yes, so many women think red makes them look "cheery"- love the sherry bottle reference. The same goes for parrot green. Karen: A rosy red is a rare, exquisite shade. lady jickey: I like the attitude of red lipstick, such a statement- but it makes me look crazed. One of those things that's terrific... but not on me. I'm posting on lipstick soon. materfamilias: Sundresses don't need to play by rules! My two sundresses are in the back of my closet for I'm rarely in the country. Lovely post, Duchesse. Thank you for giving us so many reds to look at and think about. I adore that red dress from Barbara Tfank. Wow, I just swoon over that color. And the paprika from Talbot's. Beautiful. Interesting that I was drawn to the "browned" red in the Talbots coat. Recently I took a risk with a slightly berry-leaning red wrap top with white dots on it. ALways being very uncertain about wearing red, I finally settled on wearing it with cocoa brown linen pants, and to my surprise, I think it really worked. The brown toned down the red enough for me to feel comfortable. Black and red is really not for me. Well, I guess I'm the minority here, but I loved the first lady in the picture with all red. I thought she looked great. And I also thought Nancy Reagan looked great in the long red gown. I love red - for me, the colour of passion. But on me it has to be the cherry (bluish) red, certain wine-reds (not too murky), not the orangy Chinese red. Indeed I can't wear my red lippy any more, and have no idea what to wear if I do want a bit of colour, as I hate pastels and pinks. Yes, Advanced Style is an odd blog. There are some elegant people and some marvellously artsy ones, but also a lot of garish stuff that doesn't work and looks faintly pathetic. Out for a bicycle ride on a beautiful day! Must wear a red scarf at least. Red has been my best color from birth, I guess (as soon as Mom discovered I had perfect Snow White coloring, the pink in my wardrobe went away and the red went on). As I am now 50, I do notice that I'm better in softer reds or burgundy-reds, and the red lipstick has gone from my wardrobe. Actually, as long as I don't have a red lipstick on, but a softer color, a red garment looks better than if I have a matchy-matchy red lipstick on. Kathie: And that's why there are all shades of red in the shops! sallymandy: Isn't cocoa a wonderful netural? I wishe it were easier to find. Duchesse - for a long time, I wore Clinique's Angel Red, which is admittedly a sheerer red than many. It's almost too much for me now, and I'm wearing Clinique's Black Honey over (believe it or not) a light coat of Wet-n-Wild's Brandywine 666 lip pencil to make it last a bit longer, or Burt's Bees Fig Lip Shimmer. Always, though, I'm looking for recommendations, and I'm looking forward to yours!